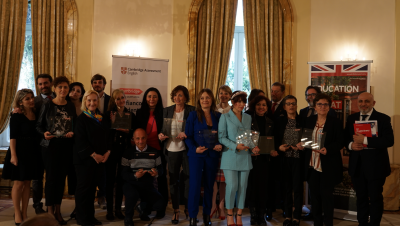 From Veneto to Puglia, from primary to secondary education, the country’s nine top English learning schools were this week awarded prizes by Jill Morris, the UK Ambassador to Italy, in Rome. The prize-winning schools were as follows: ‘Dante Broglio’ in Colognola ai Colli (Verona), ‘l’Istituto Comprensivo Aldo Moro’ in Marcianise (Caserta), ‘l’Istituto Comprensivo’ in Casella (Genoa), ‘l’Istituto Comprensivo di Sant’Elia’ in Fiumerapido (Frosinone), ‘Dante Alighieri di Matino’ (Lecce), ‘l’Istituto Comprensivo Nelson Mandela di Roma’ (Rome), ‘l’IIS Filelfo di Tolentino’ (Macerata), ‘l’IIS Copernico-Carpeggiani di Ferrara’ (Ferrara), and ‘l’IISS Canudo - Marone - Galilei di Gioia del Colle’ (Bari). These nine schools were chosen from over 5,000 state-run schools who run the Cambridge English Language course. They were awarded on the basis of their results as well as the impact they were having on education and learning. “This is a great recognition for Italian schools, their directors and their teachers who prepare their students for Cambridge English exams with passion and perseverance. “Thanks to the collaboration with our authorized centers in Italy each year, hundreds of thousands of students have the opportunity to acquire a valid title at an international level,” said Alberto Svelto, the Senior Manager for Cambridge English in Italy. “It is a great please to again host Cambridge Assessment English at Villa Wolkonsky to celebrate the excellence of the Italian schools, as well as the commitment of the exceptional teaching and directing body, in the field of English. It is beautiful to know that our language is appreciated and loved so widely in the this wonderful nation,” added Morris at the event. Cambridge English also revealed that in the last five years, over 1.2 million English language exams have been sat in Italy with a 98 per cent pass rate.